The nomenclature of the bicyclic and spiro (mono) compounds are easy to understand. But when the number of spiro atoms or the number of rings exceeds 2, the nomenclature turns very complex. I cannot understand the method of numbering the carbons and the method of writing those bracketed numbers with dots and superscripts. I have read the IUPAC Recommendations 2004, but the text given there is really hard to understand (for me only, I hope). 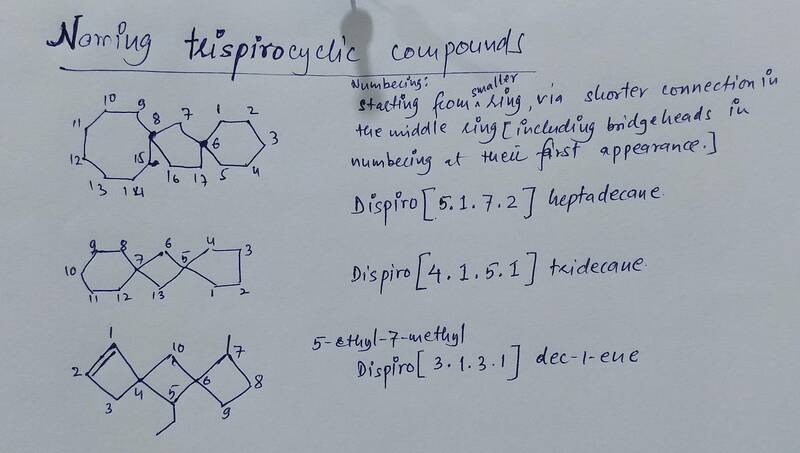 I want to know the method of writing those numbers with the superscripts inside the bracket for spiro and cyclo compounds. 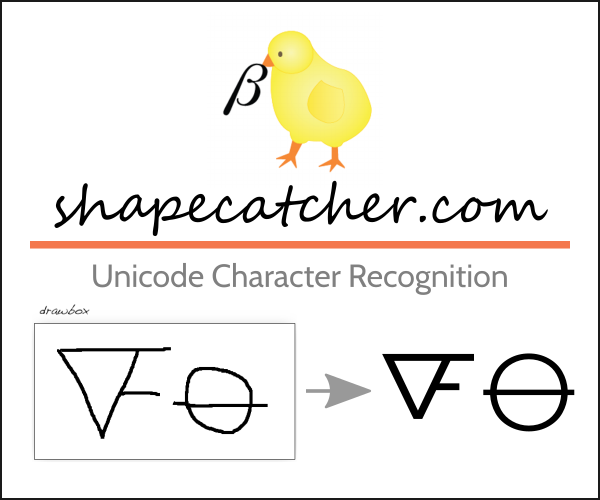 Diagrams with arrows or a detailed text with one particular example, will be helpful. Locate the bridgehead carbons, the carbons part of two rings. 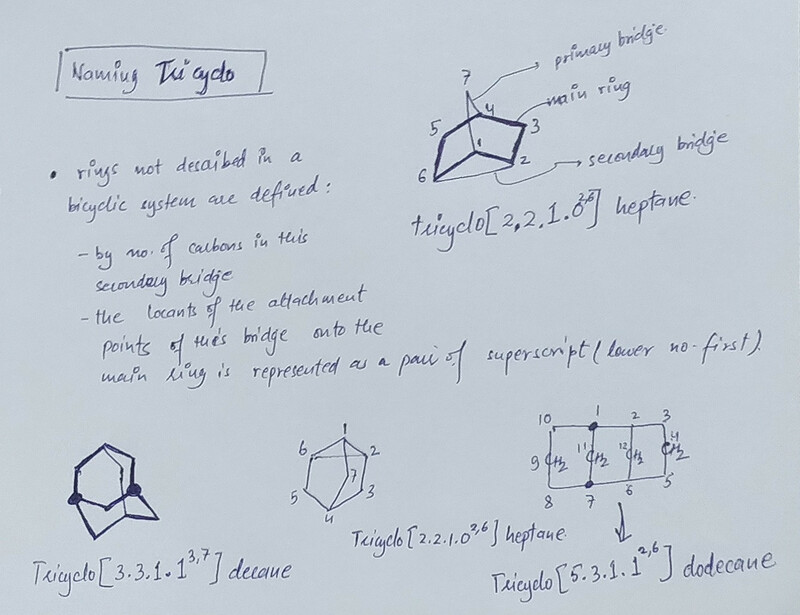 Now, identify the three connections between the 2 bridgeheads, called bridges: arrange these in decreasing order of number of carbon atoms (excluding the bridgehead). Say these three numbers are m, n, o [m > n > o]. Write the name of your compound as: bicyclo[m.n.o]"m+n+o+2"alkane. In case there is a substituent or a functional group is present, you need to number your carbons: start from of the bridge-head, through the longest bridge to the shorter and then the shortest (if any). Other rules of IUPAC apply as such. Locate the bridgehead carbon, the only carbon part of the two rings. Now, spot the two ring systems having having 2 or more carbons: arrange these in increasing order of number of carbon atoms (excluding the bridgehead, again). Say these three numbers are p,q [p < q]. Write the name of your compound as: spiro[p.q]"p+q+1"alkane. In case there is a substituent or a functional group is present, you need to number your carbons: start from of the atom next to bridgehead in the smaller ring, through the bridgehead carbon to the bigger ring. Other rules of IUPAC apply as such. 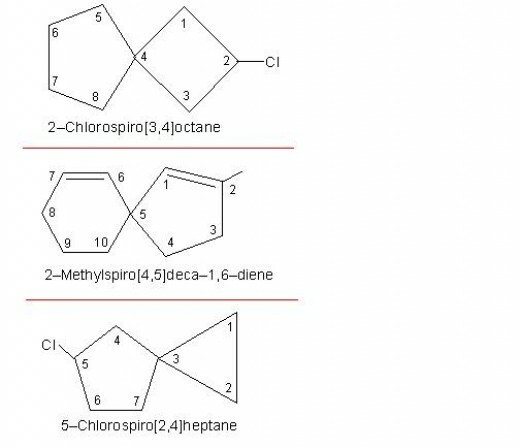 How to name tricyclo carbon compounds? How to name this cyclic compound with an O in it? If there is more than one branch in a hydrocarbon, which branch do you name first? What is the meaning of writing a catalyst name with two compounds split by a hyphen? How to name an unsaturated spiro compound with many substituents?